Gaze at the stars with this handy telescope! Pocket sized for easy transport and it magnifies up to 8x! Perfect for those starry nights! Telescope measures 7 1/2" long. This adorable and pink plush elephant never forgets to sing his favorite song. Give his foot a press and he bobss his head, and flaps his ears to the music while singing "Do Your Ears Hang Low." Its great to collect and add him to our other fun and exciting singing and animated animals. Elephant stands 12" tall and requires 3 AAA batteries included. FILL YOUR BATHROOM WITH DONALD TRUMP'S VOICE - Prank friends and family with this ingenious Donald Trump toilet paper roll holder that makes your regular toilet paper talk! Just insert it into any roll of toilet paper and PREPARE FOR SOME SERIOUS LAUGHS! 100% AUTHENTIC DONALD TRUMP - Digitally recorded in high quality sound definition from Trump's speeches and interviews, this Donald Trump toilet talker makes a perfect novelty gift to prank your friends and family. Includes 8 of his most famous sayings. Batteries included. Our LED music Flying Disc with wireless speaker is perfect for home, beach, camping, tailgating and pool fun. Disc has incredible sound quality adding to music and fun all in one! Its easy to charge the rechargeable battery with its USB magnetic charging cable. Have fun with friends and family during the day or night with this durable LED illuminating flying disc. Additional features: wireless speaker has a range of 160 feet, waterproof and magnetic USB charging (cable included). Comes in assorted colors (our choice please). For ages 8 and up. Having trouble getting the fellas to remember to put the seat down? This handy device plays music with flashing lights and fun voice messages helps remind him to put the toilet seat downwhen he's done.He's even rewarded by crowd cheers when the seat actually goes down! A light flashes every 15" to let you know when the seat is up in the dark of night. Its peel and stick backing attaches easily to the underside of any toilet seat and its water resistant case guarantees hygiene. You better have a sense of humor to deal with this ridiculously hilarious wisecracking parrot. Just walk pass his motion sensor and his beak moves and wings flap as he lets fly five insulting phrases like, "You better stop taking those ugly pills--you're making me sick!" 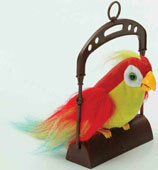 He even comes with a perch so you can hang him to surprise those unsuspecting guests. Walter requires 3 AA batteries (not included). see if you can keep up with this adorable and huggable plush fellow. Chuck loves to challenge you in a hilarious round of tough tongue twisters songs. Can you keep up? Press his foot, and his mouth, head and body moves as he takes the tongue-twister and makes a game of it, singing faster and faster each time, challenging you to keep up! The whole family will have fun singing one of the 3 tongue twister songs and "The Green Grass Grows All Around" song. Chuck sits 12" tall and requires 3 AA batteries included. For those quick fix-it jobs whether at home or on the go, our World's Smallest Tool Kit is the perfect kit to have on hand! Kit includes (2) Screw Drivers, (1) Tape Measure, and Mini Tool Box with keychain clip. Never get caught without the right tool again! This lifelike fish bowl is a fun desktop conversation piece and is perfect for anyone who wants a pet without the responsibility! 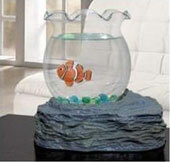 Place this classic fishbowl atop the included reef base, add water, dishwashing liquid, and the clown fish. This aquarium uses the magnetic field of the fish and the magnetic field of the moving magnets in the base to create realistic swimming movement. Ideal for your desk at home or at work, this novelty lifelike aquarium toy is sure to add calm, laughs, and entertainment to any environment. Complete with a Lifelike Fish, decorative Fishbowl, realistic Plastic Reef Bowl Base, translucent Aquarium Pebbles to decorate the fishbowl. Fishbowl measures 5" x 4" x 4" and requires 2 AA batteries, (not included). For ages 8 and up..